1201 First St. at B Ave. 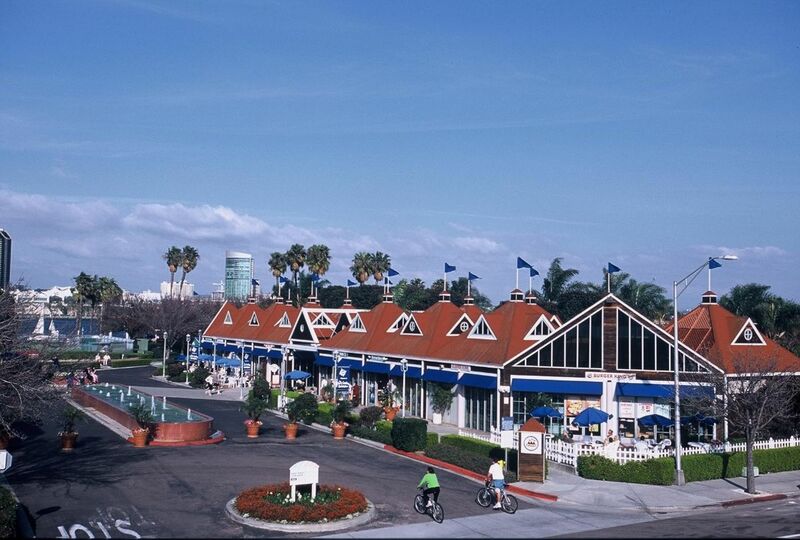 The striking architectural design of Coronado Ferry Landing is reminiscent of the famous Hotel del Coronado. 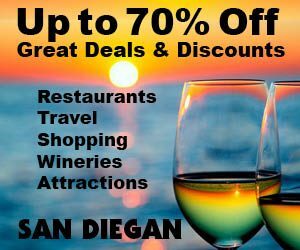 It’s home to a sensational restaurant row made up of seven bayfront fine and casual dining including Peohe’s, Coronado’s premier waterfront restaurant, and Il Fornaio, serving exquisite gourmet Italian cuisine. If you like to dine and shop, this is the place to be. There are also several excellent shops and galleries offering unique gifts, collectibles, imported fashions, beachwear and more. 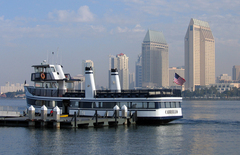 Coronado Ferry Landing (1) is located at the foot of B Avenue on the bayfront in Coronado at 1201 First St. (619-435- 8895). The stores open daily at 10 a.m. The restaurants have extended hours and ample free parking. 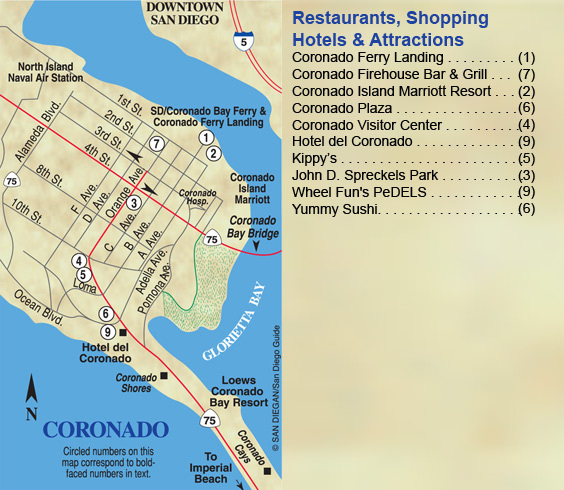 A great way to save money is to receive the Coronado Ferry Landing shopping pass. It’s good for exclusive discounts at the center. The shopping pass is free at Captain Coronado (Q). You can begin your tour of the shops anywhere. 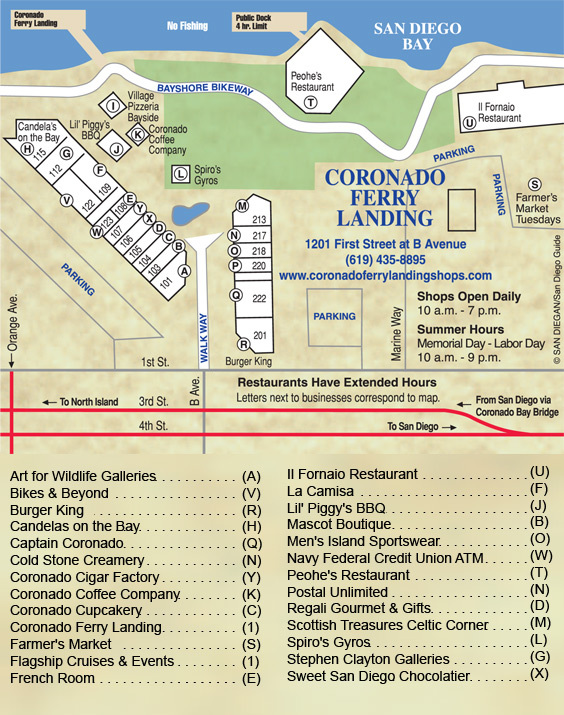 And the handy map in this chapter will help you navigate through Coronado Ferry Landing. The letters in the text correspond to the half page map on page 230. Then you can do what most people do and dine at one of the many excellent bay view restaurants. Plus, if you need extra cash there is a Navy Federal Credit Union ATM (W) here too. Stores open daily at 10 a.m. Located at the foot of B Avenue on the bay in Coronado. Its restaurants have extended hours. 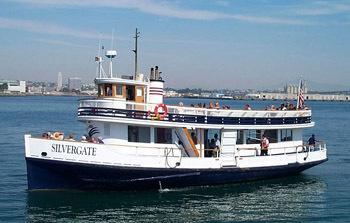 Whether you come by car or aboard the San Diego Harbor Excursion’s Ferry from their two locations in downtown, the Coronado Ferry Landing is the perfect place for a fun day trip! A top attraction here is the Art for Wildlife Galleries (A) at suite 101 (619-435-4342). This gallery deserves a special visit. The paintings, prints, sculptures, wood carvings and pottery are works of art that anyone would be proud to display in their home or office. The other must-see gallery is the Stephen Clayton Galleries (G) at suite 111 (619-435-1319). Featured here are world renowned, collectable artists such as Dr. Seuss and Mackenzie Thorp. Plus, they have many gallery shows with the artists in attendance. Meeting the artist is always a treat. They have also done exquisite framing for the past 15 years. Catering to travelers is Mascot Boutique (B) in suite 103 (619-435-0548). They have a fine collection of Hawaiian print clothing with new arrivals weekly including Baggallini fashion bags, Asian imports, hats, sunglasses and shell inlay jewelry. Tucked in between these delightful shopping discoveries is Coronado Cupcakery (C) in suite 104 (619-437-0166). They make dozens of delicious varieties of cupcakes to snack on. Aptly named Regali Gourmet & Gifts (D) in suite 105 offers unique gift ideas such as hand painted ceramics, gift cards, kitchen accessories, gourmet food items, gift baskets for all occasions and souvenir items. Choco Amore (X) in Suite 106 (619-437-0345). Among their many delicious treats are hand-dipped chocolates, world famous candy apples, chocolate-dipped strawberries, sugar-free chocolates and more. Coronado Cigar Factory (Y) in Suite 107 (619-437-0229). Originally from Las Vegas, they carry hand-rolled and name brand cigars and smoke accessories like Panama hats and guayabera shirts. French Room (E) in suite 108 (619-437-4325) is a shoe store carrying first class women’s clothing and 80 styles of name-brand shoes such as Merrell and the always popular Onex shoes. They also carry designer inspired handbags, jewelry and resort wear fashions. The classic one-stop gift shop has to be La Camisa (F) in suite 109 (619-435-8009). They offer the classic items you’ll need for a Southern Californian vacation as well as gift items to take home. These items include real seashells and beach accesssories. Since Coronado is a resort town you are bound to find a wide variety of resort shops. Men’s Island Sportswear (O) at suite 218 (619-437-4696) is one of these shops. It has name-brand items from Reyn Spooner, Kahala D’Accord, Bamboo Cay, Scala, Aurey’s Hawaiian shirts and Tshirts with cool names on them. They also carry a wide range of US military hats. Captain Coronado (Q) in suite 222 (619-435-1268) keeps up with the theme of resort wear and gift items. They offer a fine selection of wind chimes, candles, T-shirts and home decor items. The newest addition to Coronado Ferry Landing is Treasures From Abroad (N) in suite 217. The new shop will carry traditional apparel, gifts, mementos and handcrafted items imported from India, Egypt and Africa. Coronado Ferry Landing even has an often in-demand post office called Postal Unlimited (N) in suite 217 (619-435-3100). What’s a gift if it can’t be gift wrapped or mailed home so you don’t have to lug it around? More good news is that every Tuesday afternoon is a Certified Farmer’s Market (S). From 2:30 p.m.–6 p.m., you can do what the locals do. You can shop for fresh vegetables, fruits and a bouquet of fresh flowers. It’s all grown and sold by local farmers. Coronado Ferry Landing also offers free concerts throughout the year. So for a fun excursion with plenty to do, put a visit to Coronado Ferry Landing at the top of your to do list to Dine, Shop, Play and Enjoy. When you think that you’ve seen it all, it’s really only the beginning when you opt to rent a bicycle, surrey or in Roller blades from Bikes & Beyond (V) at suite 122 (619-435-7180). This side of Coronado Island has a bayside sidewalk that is best explored by bike. When you see people riding them, it makes you want to do it, too. Plus, Coronado is totally flat so you can easily explore the majestic tree-lined neighborhoods. The fun doesn’t stop here. 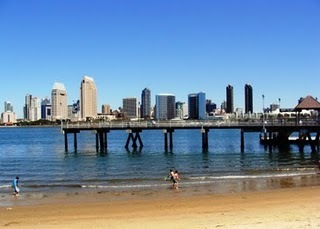 Besides shopping at Coronado Ferry Landing, it’s also home to delicious places to eat and drink. Almost all have romantic bayfront ocean views. 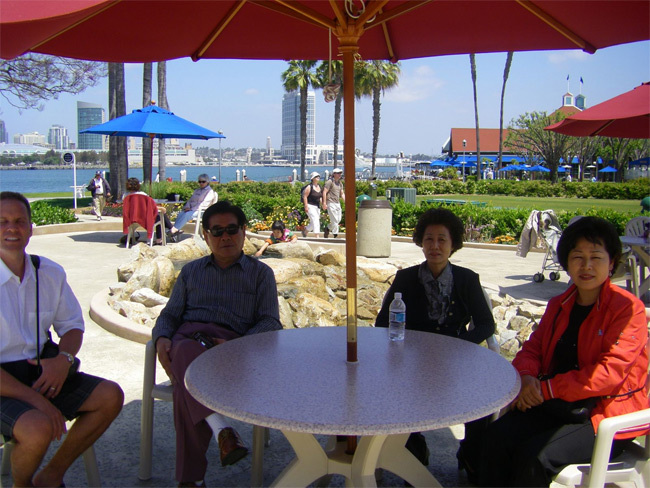 Everyone’s favorite is the one and only Peohe’s Restaurant (T) in suite 3 (619-437-4474), which overlooks the bay. Diners will be enthralled with its tropical decor that even includes a stream running through it. As you might expect the menu focuses on fresh seafood selections. They even have a full sushi bar and seasonal live entertainment. Their Sunday Brunch is world-renowned for its presentation and its spectacular bay view. A no less spectacular dining destination with wonderful gourmet Italian cuisine and a romantic bay view to match is Il Fornaio Restaurant (U) at 1333 First St. (619-437-4911). It’s like taking a culinary journey to Italy. Everything is fresh and delicious. Another bayside restaurant with show stopping views is Candelas on the Bay(H) in suite 115 (619-435-4900). Diners like to sit next to the huge bay window or on their delightful patio and enjoy the romantic bay views. They serve French/Mexican fusion cuisine. More on the casual side is Village Pizzeria Bayside (I) in suite 6 (619-437-0650). They offer an unbeatable view to go along with their unbeatable pizzas and pastas. You can even buy their pizza by the slice to eat with a cold brew. Little Piggy’s BBQ (J) in suite 5 (619-522-0217). Their informal presentation and delicious baby back ribs have made this place a winner! Also popular is Spiro’s Gyros (L) in suite 4 (619-435-1225). It as an excellent harbor view to go along with the host of delicious Greek delicacies it serves. Add a glass of beer on tap or one of their fine wines for a nice meal on their bayside patio. 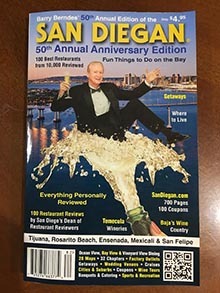 They are open daily till 8 p.m.
Having a Burger King (R) in suite 201 (619-590-1122) certainly attests to the notion that Coronado Ferry Landing has something for everyone’s taste and pocket book. After a delicious meal head for their Cold Stone Creamery (P) in suite 220 (619-437-6919). This popular ice cream shop offers over 50 delicious flavors. And every selection is made to order. Coronado Coffee Company’s (K) is perfect for a freshly ground brew of your favorite coffee in regular or decaf. Then find a nice bench to enjoy your treat and a bay veiw.